Pinch the skin on the back of your hand, then release it and watch it fall. Your skin gradually slides back into place. Constantly healing and being recreated, our skin both protects us and offers us the sense of touch through which we experience the world. In our modern times, touch and religion can make for troubling associations, but I want us to re-imagine touch as holy and to see that a spiritual practice involving appropriate touch—and ways of connecting to God through touch—can offer healing, stability and solidarity in today’s touch-sensitive world. Touch is the first sense we experience. We grow in constant physical touch with our mother and touch is our first means of communication. Touch works with the other senses, in particular with vision, in generating meaning. Our sense of proprioception (“the perception of stimuli relating to position, posture, equilibrium or internal condition”) tells us where our bodies are in relation to our world. Even the word “perceive” comes from percipere (“to grasp”). Touch is a metaphor for emotion. We might say something is touching or that we know how someone feels. It is through both sight and touch that we experience and process our changing world. Unlike vision, however, touch is not a sense we can switch off, and the absence of received touch can be a major problem: Consider homeless people and the amount of physical contact from other people that they receive—or lack. The medical world is increasingly aware of the fundamental importance of touch for health. Practices of therapeutic touch used for premature babies, the elderly and the sick have been proven to aid in recovery and development. Ahead of her time, the late Princess Diana was admired for holding the hands of AIDS patients she visited, during a period when the disease was poorly understood. We admire such behaviour because we recognize instinctively the importance of ethical, permitted touch for recovery and resilience. Touch is thus a highly empathetic sense. It is clear, then, that touch is central to our human experience, yet there is no getting away from the fact that we cannot touch God. 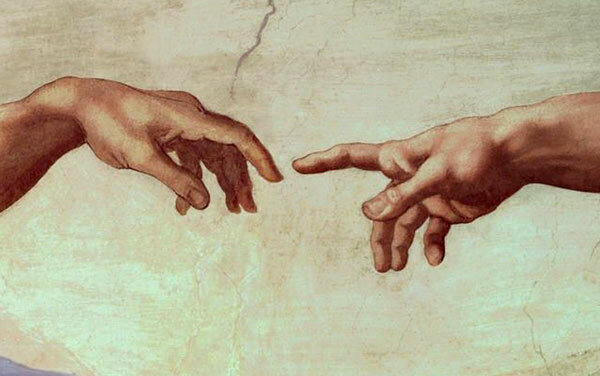 In “The Creation of Adam” by Michelangelo, there is an unresolved space between the fingers of Adam and God. They do not touch. God’s hand is outstretched while Adam’s is lazily raised. We may often feel like the reverse is true, that we are stretching while God is just waiting for us to try a bit harder. What then are the ways we can connect with God through touch? What would it mean to consider touch holy, to make of it a spiritual practice? First, touch is holy in connecting us with our emotions, our loves and our fears. It is no coincidence that we use the same word for emotional affectedness and for physical contact. Touch is not only pivotal for how we sense and experience the world, but also for our emotional engagement with it. Many times in the Bible we see images of God as holding, carrying or embracing us, and we naturally feel this as a comfort. We react emotionally to tactile images such as the father of the prodigal son, who ran to his son, “threw his arms around him and kissed him” (Luke 15:20). Both real and imagined touch connect our sensory experiences with our emotions. As small children, we clung instinctively to our parents when we felt afraid. We often close our eyes to enhance our sense of touch, and we close our eyes to pray. Closing our eyes and turning up our hands embody our desire to reach out to touch the Divine, like the blind, homeless beggars that Jesus often healed through his touch. It moves us to consider that God has our name inscribed into the palm of his hand (Isaiah 49:16). The emotional connection with touch is one reason why the cross of Christ impacts us. We can imagine the feel of the rough wood on his skin, as well as the emotional and physical pain of nails and a spear through his body. Touch is also holy as the point of contact between imagination and grounding. In a changing world it tells us what is real. Touch connects deeply with belief, with proof, with our sense of reality: Just think of Doubting Thomas. Many people like to work in the garden to feel real through touching earth. We touch our own wounds, and some may harm themselves, as if that touch, even though damaging, affirms that they are real. We also see this idea of holy grounding in Exodus 3, where Moses meets God in the burning bush: God calls to Moses, saying, “Come no closer! Remove the sandals from your feet, for the place on which you are standing is holy ground” (Exodus 3: 6). We are used to interpreting God’s command to Moses as a prohibition or a warning: Moses is instructed to take off his shoes because they are unclean. But what if we read it instead as an invitation? That God invites Moses to take off his shoes so that Moses can feel the holy ground with the sensitive soles of his bare feet? Moses hides his face, covering his eyes while his feet are planted on the real, holy ground. Suddenly, everywhere we tread in bare feet is holy ground. God is inviting us to touch with our skin what God has touched, created, moulded. Perhaps our greatest need in a shifting world is to feel that sense of grounding, to know where we are rooted. Touch is holy because it plants our feet on God’s created earth, on the dust from which we are formed. It reminds us that a human and divine act of touch brings us into existence, that life is breathed into us and we are intricately woven (Psalm 139). Touch makes us real in a literal sense, so touching is believing and it is powerful. In Mark 5 we read of the woman who had endured many years of bleeding and suffering, and who still defiantly believed that she could reach out to Jesus for healing. She knew that if she but touched the hem of his garment, she would be made well. The woman did not touch Jesus himself, only his clothes, but she understood that this was enough, that he would do the rest. We are also unable to touch Jesus and yet God knows that we are created so that touch is necessary for our health and wholeness. Even though we cannot reach out and touch Jesus, we can still reach out to God—even if we can’t touch God. God responds through the Holy Spirit, who is with us and within us. Flesh wounds will only heal if they are not touched from the outside; the healing is internal, cell on cell building on each other from the inside. Our bodies are created to be constantly healing from the inside out. Like the cell on cell of internal physical healing, the Holy Spirit touches and heals our spirits, cell on cell, constantly and gradually healing us from the inside out. This touch is holy; God is more tactile than given credit for. As we think about Jesus’ death, we remember that he experienced damaging, painful touch for our healing. Jesus’ body was wounded, struck down, crushed, bruised, pierced, crucified. As a divine human, Jesus carried and bore the opposite of healing touch in order that through his wounds we might receive the slow salvation of the Holy Spirit’s healing and redeeming touch on our soul (Isaiah 53: 4-6). When Jesus rose from the dead, he still bore the marks in his hands and side. He was scarred for life, both his own and ours. These marks were the way he proved his identity to his disciples. In our lives of stress and burden we all carry marks, but we are alive and we are being made whole, as we are formed into the image of Christ. Every one of us is made in the image of God. The next time we are invited to touch another person through a handshake or a hug, we can look to recognize this divine image in each other and in this way touch the hem of Jesus’ garment. As we pass the peace we are doing exactly that, passing tangible peace to each other. In the spiritual practice of appropriate, permitted touch of another—or of creation—we participate in a holy moment of stability, solidarity and healing. Touch is holy. It is life-affirming to our humanity and central to our connection to God. In a touch-sensitive world, we must certainly be wise, but also fierce in following Jesus’ call to especially embrace and touch those on the margins, trusting the Holy Spirit’s healing inner touch, and accepting God’s loving invitation to walk on holy ground. Emma Pavey is a member of Langley (B.C.) Mennonite Fellowship. This article originated as a sermon delivered there, and was developed from graduate work at the Vancouver School of Theology, where she is a Th.M. student. 1. As you go through your daily life, in what situations do you touch other people or experience them touching you? Who is most apt to initiate touching? How important is touch in greeting someone? Is touching others something you welcome or something you try to avoid? When do we most feel in need of touch? 2. What are the rites or practices of the church that involve touch? How important is touch in these moments? What are some examples of touch in Jesus’ ministry? What is the relationship between touching and healing? 3. Emma Pavey uses the phrase “appropriate touch.” What is the point where touch becomes inappropriate? Has fear of inappropriate touch led our culture to avoid touching? What happens when people are deprived of touch? Can too much touching lead to inappropriate touching? 4. How do you respond to Pavey’s comment, “Touch is holy because it plants our feet on God’s created earth, on the dust from which we are formed”? Although we are not literally able to touch God, what are some ways that we can feel touched by God? How can we extend God’s touch to others?